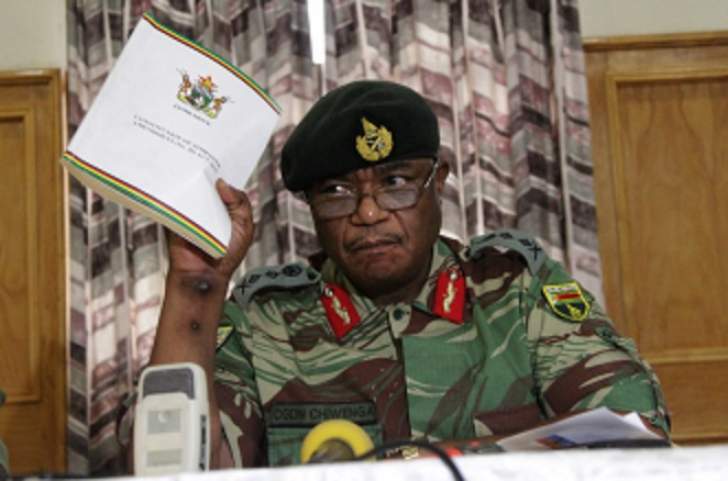 A coup is reportedly under way in Zimbabwe, with reports on social media claiming that the head of Zimbabwe military Constantino Chiwenga has given President Robert Mugabe 24 hours to vacate office after sacking his vice president Emmerson Mnangagwa. At least 3 explosions have been heard in Harare following the takeover of the ZBC by the army. I am in Harare CBD & It's business as usual. Let us spread accurate stories. But ngavabayane stereki. They are all criminals...all of them. eNCA is quoting sources in Harare as saying that the visibility of army tanks is an indication that this is a "show of force" by the Zimbabwean army and not a coup, as yet. President Robert Mugabe's famous ‘blue house' or ‘blue roof' has been sealed off by heavily armed military personnel, Khuluma Afrika has confirmed. Whilst reports on social media seem to imply that a coup is underway, Khuluma Afrika understands that military presence has been increased there to improve security in the face of growing uncertainty in the country. President Mugabe however is not at the house as we speak, and Khuluma Afrika was able to confirm that his motorcade is still at his Munhumutapa offices in the capital. Additional army units as well as secret service personnel have been dispatched to the offices as well. Khuluma Afrika has been told that the cordoning of ZBC premises is inline with these security measures. Historically President Mugabe is generally afraid, and interprets any show of defiance as risk of a possible coup and has in the past tightened his personal security over simple things like social media dissent, or strikes by workers. Fears of some sort of revolt grew over the last few hours after several army tanks were spotted headed for the capital, and major arteries out of Harare were closed. Some Harare residents reported told News24 that some uniformed soldiers were deployed in street corners all day Tuesday. Zimbabwe is facing a political crisis with the ruling Zanu-PF party, as a very public showdown over who is likely to succeed President Robert Mugabe plays out. The current standoff is between the Youth faction, loyal to his wife, Grace Mugabe, and the former liberation fighters, loyal to Emmerson Mnangagwa, the vice president who was fired last week. Here is what AP is reporting: Harare - Zimbabwe is on edge as army tanks are seen outside the capital a day after the army commander threatened to "step in" to calm political tensions over the president's firing of his deputy. The Associated Press saw three tanks with several soldiers in a convoy on a road heading toward an army barracks just outside the capital, Harare. While it is routine for tanks to move along that route, Tuesday's timing heightens unease in this country that for the first time is seeing an open rift between the military and 93-year-old President Robert Mugabe. Mugabe last week fired Vice President Emmerson Mnangagwa and accused him of plotting to take power. Over 100 senior officials allegedly backing Mnangagwa have been listed for disciplinary measures by a faction associated with Mugabe's wife. A journalist in Harare says that "it seems the army is angry". He says the situation is a bit "tense" in the capital. State media in Harare sends workers home! Reuters reports that four tanks were seen heading toward the Zimbabwe capital Harare on Tuesday, witnesses said, a day after the head of the armed forces said he was prepared to “step in” to end a purge of supporters of ousted vice-president Emmerson Mnangagwa. The report says that two other tanks were seen parked beside the main road from Harare to Chinhoyi, about 20km from the city. One of the tanks, which was pointed in the direction of the capital, had come off its tracks. Soldiers, however, refused to talk to journalists, the report says. Earlier on Tuesday, Zimbabwe's Zanu-PF youths said they were "prepared to die" in defence of President Mugabe's government. In a statement on Tuesday, Zanu-PF's secretary of the youth league Kudzai Chipanga said that Zanu-PF youths did not take lightly the military's threats. "We as Zanu-PF youth league are a lion which has awakened and found its voice, therefore we will not sit idly and fold our hands whilst cheap potshots and threats are made against Mugabe," Chipanga said. Said Chiwenga: "The current purging and cleansing process in Zanu-PF which so far is targeting mostly members associated with our liberation history is a serious cause for concern for us in the defense forces" He added: "We must remind those behind the current treacherous shenanigans that when it comes to matters of protecting our revolution, the military will not hesitate to step in. The current purging of which is clearly targeting members of the party with a liberation background must stop forthwith." Chiwenga on Monday demanded a "stop" to the purges in the ruling Zanu-PF party following the sacking of vice president Emmerson Mnangagwa. Chiwenga criticised the instability in the revolutionary party.He accused the party of expelling senior officials who participated in the 1970s war against white-minority ruled Rhodesia; saying "counter revolutionaries" were plotting to destroy the party.